When I was a kid I used to always wish for snow because it meant I could have a lot of fun making snowmen, snowangels and having snowfights with friends. Playing outside in the snow was always fun and the only time I had to go outdoors during winter. Well, now I must confess, I have an intense love-hate relationship with snow. The hate part is mostly due to the immense disruption it causes to our transport infrastructure because unlike Russia, Scandinavia or other places where it snows regularly we don't get that much snow and when it does snow we're not prepared for it. My guess is we will never be, but I don't want to talk about that. However, watching snow fall is beautiful. Nature at it's best! As snow begins to settle it makes the normally humdrum look of our town more pleasing and picturesque when it has a thick white blanket covering it. Unfortunatelly, it doesn't last much as mud and slush will take its place. 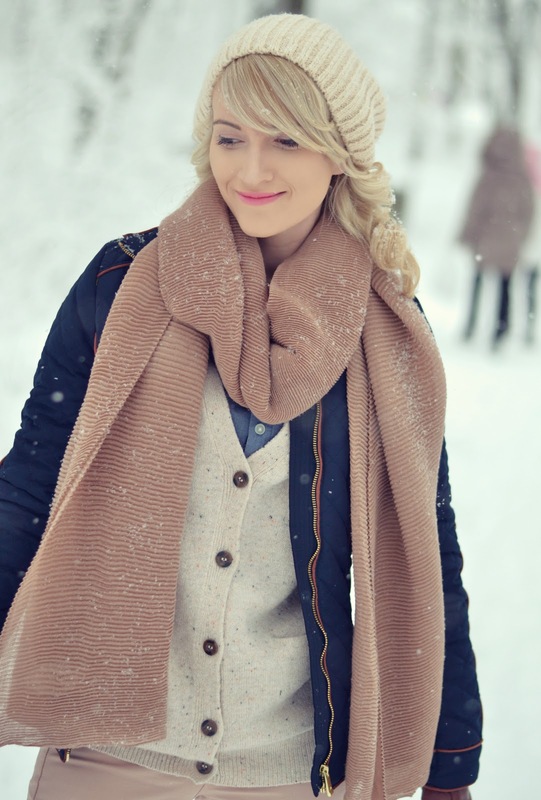 In the movies, it might look cute when snowflakes fall on a girl's perfect curly hairstyle. In real life, snow quickly melts into water, which is the fastest way to mess up your hair. I learned this the hard way. So, always wear a hat or beanie when it snows! Ce poze frumoase Vale, ati iesit cand ningea :X Supeeer.